Robotic bollards that can quickly move across a carriageway to close off lanes have been developed by US engineers. Each 130cm-high robot takes the form of a bright red barrel which sits atop a three-wheeled motorised base. A group of the bollards can be directed into position with a laptop and a main control unit equipped with a satellite navigation system for accuracy. 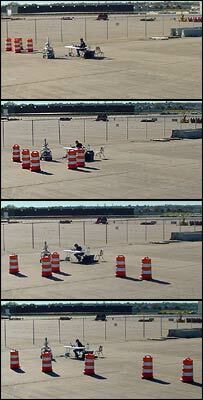 A University of Nebraska-Lincoln team has told New Scientist magazine the robots could improve roadside safety. "Deploying and retrieving highway markers on open roads is hazardous so the robots will reduce risks for workmen," researcher Shane Farritor said. The project is still at the prototype stage and costs will have to be reduced to make the idea commercially viable. Farritor's team hopes to get the unit price down to $200 (£110). "At that price I believe the savings will mean it will still be affordable if one dies in the line of duty," said the engineer. It is envisaged the road markers would be delivered to a location by a specially equipped truck. A camera on the vehicle would image the road and send a picture to a worker's laptop. The worker would then indicate on the screen where they wanted the bollards to be deployed. Software developed by the Nebraska team would then obtain the precise coordinates and feed these to the "shepherd" unit so it could lead its herd of red robots into position. The bollards, which are connected via a radio link, move at just over a metre a second. The shepherd constantly monitors them for positional errors and can, if necessary, remove an errant robot from the line-up. "It's a pretty simple idea," Assistant Professor Farritor, from the university's Walter Scott Engineering Center, told BBC News. "They can self-deploy and self-retrieve, and remove workers from the dangerous job of putting out these safety devices. "We're designing the system in such a way that the barrels are very stupid - so that they are very reliable and inexpensive. "High reliability is a concern but we think we're making great progress and have a solution that will work."